Vintage and kitschy styles are having a moment as far as home decorating trends go. There is a movement towards re-purposing old or formerly unused objects into pieces of art or useful items. If you enjoy creating things and are willing to put in a bit of work, many of the expensive home decorations or furniture you covet can easily be turned into a do-it-yourself project. 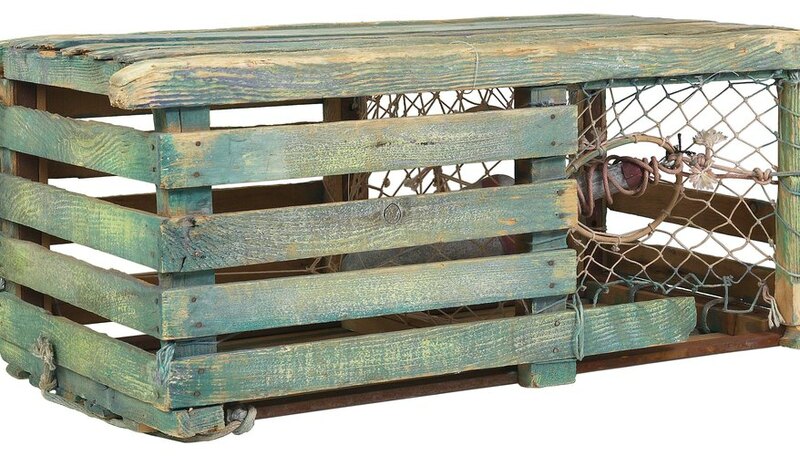 In New England, the lobster trap table has been a staple in beach homes and coastal cottages for a long time. You can buy one in a pricey furniture or antique shop, but it's just as simple - and more inexpensive - to make one yourself. Obtain a lobster trap (sometimes called a lobster pot). If you live in a coastal region, check in local fishing supply or nautical supply stores. You can also find them online for around $50. If you live near a beach, lobster traps will sometimes wash on shore after a storm. New or used is fine, depending on your personal preference and the look you are going for. The square traps are easier to work with and make better tables than the kind with the rounded, dome-like tops. Sand any rough areas on the lobster trap. If your lobster trap was used or found, clean it up as best you can. You can also paint or stain the trap if you so desire. Buy a piece of glass from a hardware or glass store. You can also order glass table tops online at sites such as Factory Glass Direct. You will want the glass to be tempered and at least 12 millimeters thick. The glass should be fairly thick and heavy to keep the table top from moving or breaking too easily. Place the stick-on rubber dots on the underside of the glass table top in spots where the glass will sit on top of the trap. Place four dots, one on each corner, and two more in the center of the long sides of the glass. Place the glass piece on top of the lobster trap. Add more stick-on rubber dots if the table seems uneven or like it needs more traction. The dots should keep the table top from shifting, and the longer the glass sits on top the lobster pot, the more secure it should become. Decorate. Place whatever decorations you want on top of or inside your new lobster trap table. Popular items include seashells or pieces of driftwood, sailboats or even a silly stuffed lobster placed inside the netting under the table. The choice is yours! If using a found or used lobster trap for your table base, it is important to make sure it is level before you place the glass top on it. You may need to make adjustments. Katrina Solano began writing freelance in 2009. Her articles can be found on various websites. She works at a publishing company in Massachusetts and enjoys writing, shopping and trying new restaurants in her spare time. Solano graduated from Merrimack College in 2008 with a Bachelor of Arts in English and a minor in communications.